It’s not enough that the west has annihilated, bombed, and committed holocausts across the globe against the “other”; now the “other” must endure the verbal and written bombs upon their faith, culture, and traditions. There is only one “Absolute” form of Free Speech in the west, the freedom and right to bash Islam, stomp, shoot, and flush the Holy Qur’an down the toilet, and portray Islam’s beloved Prophet Muhammad (p) in the most vile manner in all forms of “art”. Freedom of Speech is an ever changing and evolving right that depends on time, person, place, method of delivery, issue, and people involved. Since the time of Socrates who was prosecuted for corrupting young minds to today’s blasphemous attacks on Islam, the Quran, and Islam’s Prophet; freedom of speech has always been defined and determined by those in power. Bashing Islam is not new. In fact it began during the Prophet’s own lifetime by those who rejected his message in Arabia only to be followed by Christians, Jews, and followers of other faiths. Saint John of Damascus (7th – 8th C) while ironically working as an administrative officer for the Muslim ruler of Damascus wrote that the Prophet Muhammad (p) was a “false prophet…heretic…an Anti Christ.” Such attacks continued throughout historical Christian Europe by men such as Martin Luther, Voltaire, Dante, to , right wing European parties, to the U.S. by such men as Franklin Graham, Jerry Falwell, Pat Robertson, Hal Lindsey (who called Allah (God) Satan), and politicians. 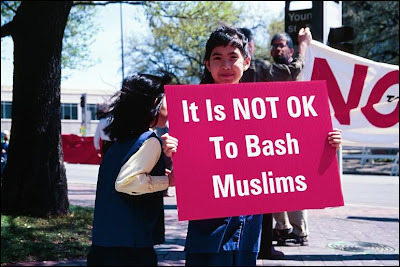 Bashing Islam has become a respectable political and money making cottage industry. Thus it’s not surprising that 9/11 opened the flood gates for a wider multitude of westerners who inflame and further incite hatred of Islam. Such vileness arises out of total ignorance of Islam and the historical innate fear of the “other”. The West fears what it does not know. In Europe, especially, fear of an Islamized Europe has conveniently morphed into a political agenda against the immigration of the “other”, mainly people of color who immigrate to Europe from formerly European colonized nations. It is inexplicable to describe the West as civilized when such uncivil behavior toward those of a different faith or color permeates a significant portion of the population. If civilization is based on education then such people must be hailed as arrogant, racists, supremacists, and ignorant fools. The European Union Human Rights reports on Racism and Xenophobia annually reports that racism against Muslims and people of color in Europe is an ever increasing problem. While the E.U. and Sweden have laws on “hate crimes”, which I consider these foul cartoons to be, they seldom if ever prosecute the perpetrators of such hate crimes if the intended victim is Islam or Muslims. On the contrary such politicians and artists are applauded and welcomed in the U.S. (Salman Rushdie, “The Satanic Verses”, in the White House), by Conservative Christians and Pro Israeli lobbies, think tanks, and the mainstream Pro Israel media as idols of free speech. Yet in Europe and the U.S. if the perceived crime is “Anti Semitic” governments are in the fore front to decry and prosecute such “hate crimes”. When Israel is portrayed in a negative light in the Arab media due to its murderous occupation of Palestinians and constant theft of their land both European and U.S. governments immediately and publicly condemn such actions as hateful and anti Semitic, but when Islam’s Prophet is subjected to vile hate it is considered “freedom of speech”. It is a fine line and slippery slope between what is considered free speech and blasphemy. Didn’t the Nazis use hateful cartoons of Jews as part of their propaganda for the “final solution? It is this double standard and hypocrisy by western governments that inflames the Muslim world against their policies and practices, especially with respect to Israel’s invasions and genocide against Lebanese and Palestinian civilians. Criticizing Israel for its illegal occupation, inhumane siege of Gaza, massacring Gaza’s children, demolishing thousands of homes, destroying hospitals, clinics, schools, churches and mosques, depriving the population of food, water and medicine, it’s massive abuse of human rights and defiance of International laws, and much more is unacceptable, censored, hateful, and strongly defended by western governments and the media as “Israel’s right to self defense”, a right that its victims are denied. Muslims are strictly forbidden from carrying out any violence or calling for death threats against the perpetrators of hate against the Prophet. The Holy Quran forbids such violence and directs Muslims to endure and be patient as the Holy Prophet endured during his lifetime. The European Council for Fatwa and Research (ECFR) and the Federation of Islamic Organizations in Europe (FIOE) condemned the death threats issued by Al Qaeda and other small extremist groups against Lars Vilks, the Swedish cartoonist, and Ulf Johansson editor in chief of the paper that published his cartoon of the Prophet with a body of a dog. Such hate must be met with patience and a strong educational outreach program to tell the truth about Islam and its beloved Prophet Muhammad (p). Perpetual racism, arrogance, and ignorance of Islam in the west are the combustible ingredients for assured mutual destruction of our planet. The lack of any sacredness in the west that belies the misguided application of free speech against the “other” rests on the premise that if I hold nothing sacred and I damn my own faith and religious figures then I have the right to damn yours and if you are civilized like me you will accept such racist rantings as free speech. That is the rational of fools who’ve surrendered their superficial intellect to misguided stupidity. What conceivable civilized aim can be achieved by denigrating a Prophet of 1.6 Billion Muslims? Why aren’t Muslims retaliating with the same vile hate against Judeo-Christian religious founders such as Moses and Jesus, peace be upon them both, or the Torah and Gospel? Because Muslims believe and revere these two prophets and the original holy revelations they received. The least that can be expected from “civilized” people who wish to criticize a faith is to have a working knowledge on the subject to confer some credibility for their critique. Such knowledge of Islam is sorely missing in the West, thus such critiques are frivolous and meaningless. Both the Danish and Swedish cartoonists who drew the vile cartoons of the Prophet were unknown entities until they entered racist contests concocted by two small papers in a competition to defame and demonize a most exalted person. After the controversy these two men achieved the celebrity status that has eluded them for decades. There are endless biographies, books, speeches and statements on Prophet Muhammad (p) by renowned authors around the world that exalt his person, his unshakeable spiritual beliefs, morality, ethics, compassion, mercy, and extraordinary leadership. The foundation for a peaceful world is the knowledge that all humanity is equal in the eyes of God and in human laws and that human nature is the same throughout time, place, and geography. The secret is simple: R-E-S-P-E-C-T.